Tomato diseases are rarely fatal if you take management steps in a timely manner. 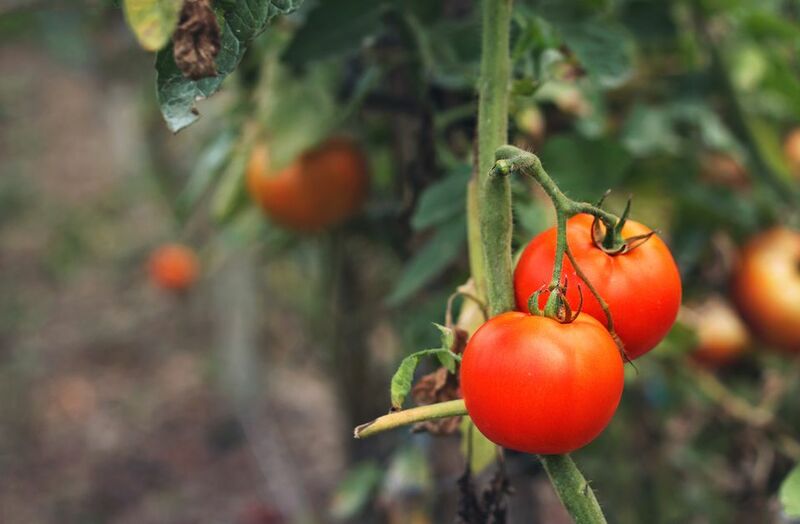 It is important to catch any disease early, before it spreads to all of your tomato plants and possibly other plants in the same family, such as potatoes, eggplants, and peppers. Some diseases affect the foliage, while others attack the fruit. Early blight can affect the foliage, stems, and fruit of tomatoes. Symptoms: Dark spots with concentric rings develop on older leaves first. The surrounding leaf area may turn yellow. Affected leaves may die prematurely, exposing the fruits to sunscald. Management: Early blight fungus overwinters in plant residue and is soil-borne. It can also come in on transplants. Remove affected plants and thoroughly clean fall garden debris. Wet weather and stressed plants increase the likelihood of attack. Copper and/or sulfur sprays can prevent further development of the fungus. The biofungicide Serenade® helps to minimize problems with early blight. Gray leaf spot affects only the leaves of tomatoes, starting with the oldest leaves. Symptoms: Small, dark spots that can be seen on both the top and bottom surfaces of the leaves. The spots enlarge and turn a grayish brown. Eventually, the centers of the spots crack and fall out. Surrounding leaf areas will turn yellow and the leaves dry out and drop. Fruit production is inhibited. Management: Warm, moist conditions worsen gray leaf spot problems. Remove all affected plants and fall garden debris. Select resistant varieties. Late blight affects both the leaves and fruit of tomatoes. Late blight is the disease responsible for the Irish Potato Famine. Late Blight spreads rapidly. Cool, wet weather encourages the development of the fungus. If you suspect you have late blight, contact your local extension service for positive identification. Symptoms: Greasy-looking, irregularly shaped gray spots on leaves. A ring of white mold can develop around the spots, especially in wet weather. The spots eventually turn dry and papery. Blackened areas may appear on the stems. The fruit also develops large, irregularly shaped, greasy gray spots. Management: Copper sprays offer some control. Serenade® works best as a deterrent, rather than a cure. The late blight fungus can overwinter in frost-free areas. Since it spreads to potatoes, it also overwinters in potato debris and seed, even in colder areas. Remove all debris and don't save seed potatoes. Septoria leaf spot is sometimes mistaken for late blight. Symptoms: Leaves develop papery patches with tiny, dark specks. Older leaves are affected first. Management: Copper sprays and Serenade® are somewhat effective at halting the spread of symptoms. Southern blight manifests as a white mold growing on the stem near the soil line. Symptoms: Dark, round spots appear on the lower stem, and both the outer and inner stem become discolored. Southern blight fungus girdles the tomato stem and prevents the plant from taking up water and nutrients. Young plants may collapse at the soil line. Management: Crop rotation seems to help. There has also been some evidence that extra calcium and the use of fertilizers containing ammonium offer some protection. This name can be misleading, as sometimes the leaves will turn yellow, dry up, and never appear to wilt. Verticillium wilt is caused by a soil-borne fungus and can affect many different vegetables. The fungus can persist in the soil for many years, so crop rotation and selection of resistant varieties is crucial. Symptoms: Wilting during the hottest part of the day and recovering at night, followed by yellowing and eventually browning between the leaf veins. Symptoms start on older, lower leaves and move upward. Verticillium Wilt inhibits the plant's ability to take in water and nutrients and will eventually kill the plant. Verticillium wilt is most pronounced in cool weather. Note: Verticillium wilt can often be confused with fusarium wilt. Management: Remove affected plants and choose resistant varieties. Anthracnose is a very common fungus that causes tomato fruit to rot. Symptoms: Small, round, sunken spots appear on the fruit. The spots increase in size and darken in the center. Several spots may merge as they enlarge. The fungus is often splashed onto the fruit from the soil. It can also take hold on spots of early blight or on dying leaves. Wet weather encourages the development of anthracnose. Overripe tomatoes that come in contact with wet soil are especially susceptible. Management: Copper sprays offer some resistance. Remove the lower 12 inches of leaves to prevent contact with the soil. Water only the base of the plant, not the leaves. Bacterial speck is one of several bacterial problems that affect tomatoes. Symptoms: Tiny, raised, dark spots, usually with a white border, on fruit and leaves. Management: Copper fungicide applied at first signs of symptoms. Blossom end rot is generally attributed to a lack of calcium during fruit set. This could be caused by too much high-nitrogen fertilizer or uneven watering, resulting in fluctuations of nutrient availability. Symptoms: Dark brown/black spots develop at the blossom end of the fruit and enlarge as the fruit rots. Management: Remove affected fruit and provide regular, deep waterings. Buckeye rot is more common in Southern states, especially during wet periods. Symptoms: Buckeye rot is similar to blossom end rot but appears on green fruit. On ripened fruit, the rotting area will appear water-soaked, but not dark in color. The rot develops on the area of the fruit that touches the soil. The spot will enlarge and develop concentric rings that resemble a buckeye. The affected area is smooth, distinguishing it from late blight, which has a rough surface. Management: Remove affected fruit and keep future fruits from contact with the soil. Gray wall essentially is a ripening problem. Symptoms: The green fruits may have a gray cast or gray blotches. Ripe fruit will have green or brown areas on the inside of the fruit. Management: Good growing conditions will prevent gray wall. Make sure plants are not heavily shaded and are receiving even waterings and fertilizer and that the soil is not compacted around the roots. Cool temperatures and stressed or unhealthy plants also contribute to the problem.